Most of the population around the world use Nokia phone, so there is more chance for having a few percent of these people busy in google searching how to flash their Nokia phones or how to reset their dead phones. Some these searchers refer online tutorials for flashing Nokia phones. 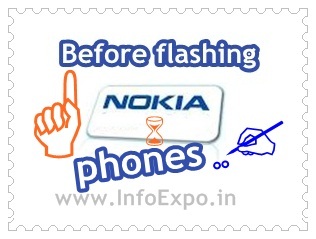 Ultimate Tips to remember before flashing your Nokia phone. Whatz the problem with referring the online tutorials...? > 100% working of the tutorial is not guarenteed. > Tutorials are not absolutly simple or perfect. > Beginners find difficulties as well as cause big mistakes which cause the ultimate death of the phone. > Tutorials may be based on the Nokia model which the authors own. > Only a few tutorials may be successfully working, finding those few is quet difficult. So due to these reasons , repeated tries is not a good idea which may harm your phone. Before making some tries by referring tutorials carefully follow below tips which can save the liife of your phone. Don't downgrade your phone firmware, downgrading of phone software cause the ultimete death of the phone. Use original Nokia USB data cable for flashing. Should maintain maximum battery charge. Our technical team is undergoing research for globalised flashing tutorials which will be applicable for all Nokia model, so keep updated with our updates though email, facebook , twitter.